For the layman, email is usually associated with major providers such as Google or Yahoo since it is free and virtually limitless in terms of storage. However, businesses often have different requirements and it is generally a good idea to look towards business email hosting. While there are free versions available with many hosting companies, many businesses take advantage of the flexibility and power of professional email services. Professional email hosting usually involves emails being managed by a separate or dedicated mail server. Disclosure: WHSR receive referral fees from some companies mentioned in this page. Our opinions and recommendations are based on actual user experience and actual market data. Before I get in too deep here let’s discuss the basics first. Although it’s not a topic on the tip of the average joe’s tongue, the basics of business email hosting aren’t very complex. Email hosting is in fact a very generic term and simply indicates what service hosts your emails. Gmail, for example, can also be considered as email hosting. However, within the scope of this article we are going to assume that you are looking at hosting your own emails. This means that you will have full control over your emails, from creating addresses and setting up how they are managed to where they are stored. When and email is sent to you it contains various details including your email address. Based on that address, the mail is then sent to a storage space that it is set up to go to. Once it is there you can open and read it at any time of your choosing. If you have bought any web hosting package it is usually very likely that the email hosting service is integrated into your web hosting package. If you haven’t then you will need to look for email hosting packages in order to use custom domains for your email. Why You Need Business Email Hosting? When I use the term business email hosting what I am really referring to is using a custom domain, like I mentioned just above. There are many reasons to do this ranging from professionalism to data security. Form a business perspective, the cost is not prohibitive, and the benefit far outweigh those costs. Using a custom domain will let your customers know exactly who they are dealing with. Because the domain is owned and managed by you, it would be difficult for someone to misrepresent themselves as belonging to your company. In the case of Company A, anyone can actually register for that email address so long as it is still available. The Company B email however will be unique to you, the domain owner. Company B’s email address also reflects the professionalism and the dedication to its business that the company has. By hosting your own business emails, you are in full control of how emails that are sent to you behave. For example, if you are in a business where there are certain regulations such as podaci локализација, you may need to store your emails on servers in specific locations. Businesses today tend to communicate heavily via email. It is likely that some of those emails will include important information such as billing, invoicing, contracts and the like. By using your own email hosting, you will be better equipped to deal with scenarios which would arise from email issues. Lost or corrupted emails could severely impact your business and the support that comes along with business email hosting could prove invaluable. What Makes Good Email Hosting? As a business, your clients need to be able to have faith in the integrity of your business. They are entrusting you with information that is confidential, such as names, email addresses and possibly even financial data. Securing your email is important and you should look out for integrated features such as data security, anti-malware, anti-spam and the like in an email host. We often check our email via various platforms that it can become easy to forget that each of them may require different configurations. When looking for a email hosting provider, ensure that you have access to webmail, POP and IMAP. Webmail allows you to use a web-based email client which is very convenient. IMAP allows you to read your email from any device without having to download them. POP on the other hand requires that you download your emails before reading them. Having your IP address блацклистед is a sure way to seeing your business activities (especially client-related!) grind to a quick halt. This can be a major issue as one your IP gets blacklisted it takes time and effort to get it clean again. Avoid email hosts who have a reputation for having clients get on blacklists as you may end up with an IP that is recycled and already on a blacklist. You can check a email host black list status using MX Toolbox. Where to Host Your Custom Email Accounts? Bundled email hosting is when you get email hosting that comes along with (hence the term ‘bundled’) your web hosting account. Depending on your needs, this can turn out to be very helpful since you won’t need to manage your emails on a separate account or pay extra for email hosting. However, bundled email hosting is often limited in space by the overall capacity of your web hosting account. Most bundles allocate a single amount of space that is shared between your email and web hosting. Aside from space, you are also sharing the amount of bandwidth allocated to your account. Who offer bundled hosting service? Some examples of bundled email hosting are the Business Hosting plans from Хостинг ИнМотион и ТМД Хостинг. If you need email hosting for more accounts or are looking for enhanced email-related features, dedicated email hosting might be the solution for you. Dedicated email hosting doesn’t necessarily mean you need to have an entire mail server for your own use, but it means the account if focused on handling email only. You will get a set amount of space and bandwidth for your account that is separate from your web hosting. Many dedicated email hosts also provide advanced features such as extra protection, automated smartphone synchronization and the like. The downside is that you will need to pay extra for your email as compared to a bundled plan. Who offer dedicated email hosting service? Not all web hosting companies offer dedicated plans for email hosting, but as an example, a clear example of dedicated email hosting plans can be found at ХОСТИНГЕР и Ликуид Веб. There are service providers such as Google and Microsoft who have email hosting solutions such as G Suite and Microsoft 365 Business. These are dedicated email services which are easy to use and powerful but need to be managed separately from your hosting even if they can use your custom domain name. The downside of this is that the services may end up costing a fair bit as your staff count increases. As an example, G Suite may only cost $5.40 for a basic plan, but that is the price to pay per user per month. Who provide enterprise email solutions? Гоогле Суите и Мицрософт КСНУМКС Бусинесс. Цена - The cost of email hosting is integrated in the bundle, so there is no additional overhead to consider. The price is ‘all inclusive’ for web hosting, email and any other features you can find that the hosting provider offers! Ease of Use – In many cases, managing bundled email can be as simple as just adding in the email addresses you want. More complex things such as MX and SPF records can be referred to your hosting provider’s technical support staff. They will be happy to help you set things up. Here are some of the best email hosting services for small businesses which I recommend. 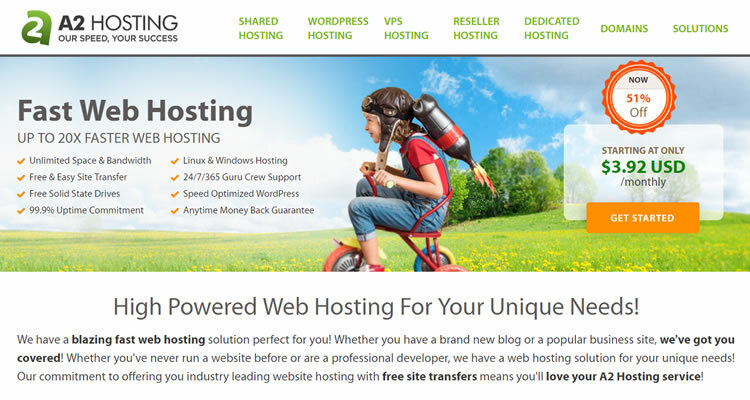 We partnered with Hostinger to give you the best hosting deals. Hostinger Single (which include email hosting service) starts at $0.80/mo for new users > Кликните овде да наручите одмах. Hostinger is based in Kaunas, Lithuania and offers a huge variety of hosting plans. The best thing about their web hosting is that it comes with bundled email hosting as well. No matter if you sign up for their shared hosting plans or even VPS hosting, they’ve got your email hosting covered. Services: Bundled and Dedicated Email Hosting. 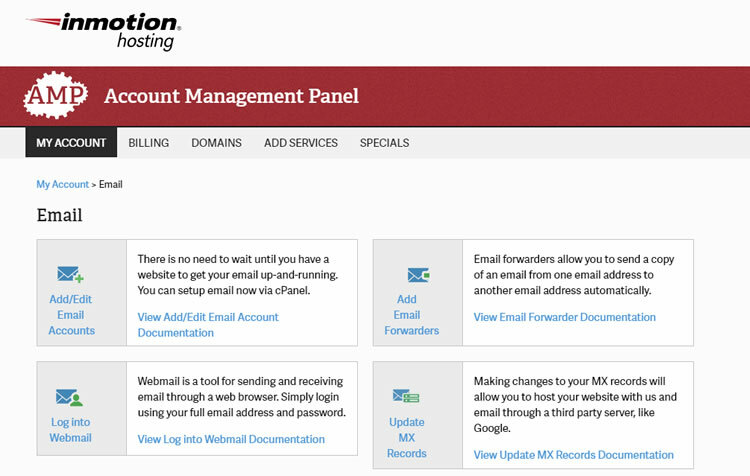 You can setup, access, and manage your emails easily from InMotion Hosting Account Management Panel (AMP). This is a big plus for those who want a simple email hosting solution. Based in both Lost Angeles California, InMotion Hosting has been around for more than 15 years. The company has long been one of our favoured hosts for many reasons and even their shared web hosting comes with email features for free. TMD Shared Hosting (which comes with email hosting service) starts at $2.95/mo. With a ten-year service record under its belt, TMDhosting has been a reliable partner for many website owners over the years. It has multiple data centre locations clustered around the US plus one in the Netherlands. With prices starting from as low as $2.95 a month, this choice is certainly a bang for buck if you consider they bundle email with their hosting plans. 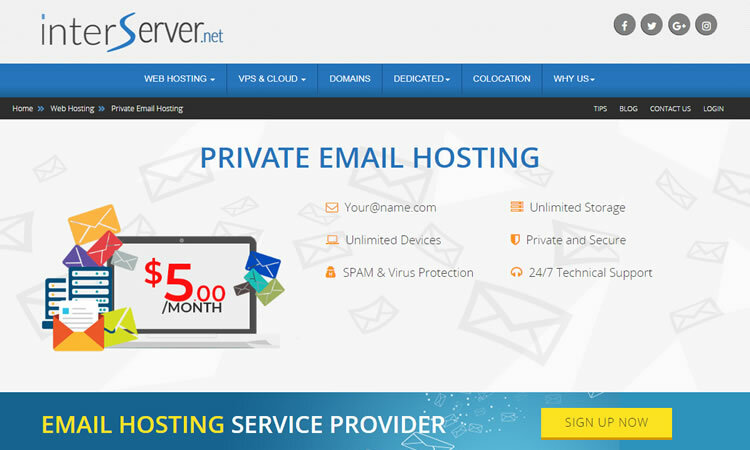 For $5/mo, you get 25 GB mailboxes with spam and virus protection at Interserver. InterServer is based in New Jersey and has been around for more two decades now – an incredibly long lifespan for a web host. 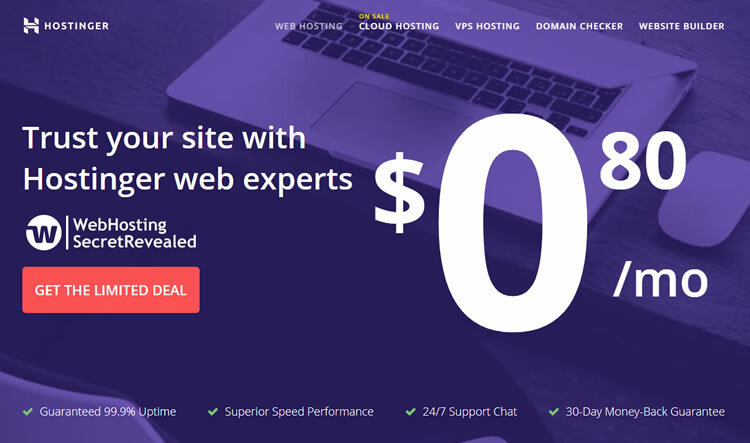 First introduced as a virtual hosting account re-seller it today covers almost the entire scope of the web hosting service spectrum. You can add 25 mailboxes in A2 Lite Plan ($3.92/mo) or unlimited mailboxes in A2 Swift ($4.90/mo) or Turbo Hosting ($9.31/mo) plan. We consider A2 Hosting as one of the top web hosts around and it has a good spread of data centre locations around the world – in Amsterdam, Singapore, Arizona and, of course, Michigan. It offers extremely powerful feature sets and combines that with a great customer experience at reasonable price points. Постоје two main types of control panel which hosting service providers mainly offer: cPanel, which is Linux-based and Plesk, which is Windows-based. Each of these have their own advantages and disadvantages, but do not really affect your email hosting. 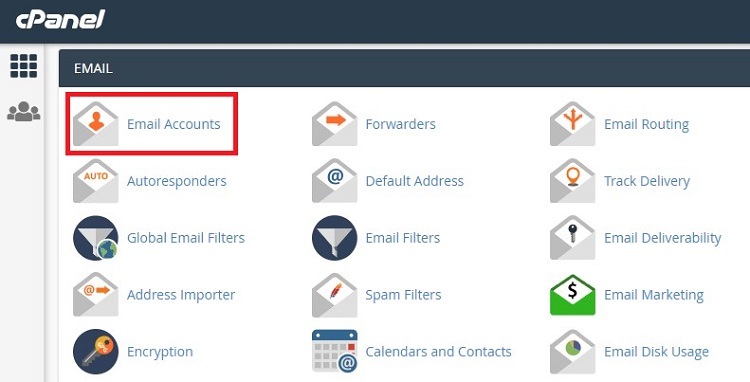 Log in to your cPanel account and click on ‘Email Accounts’. 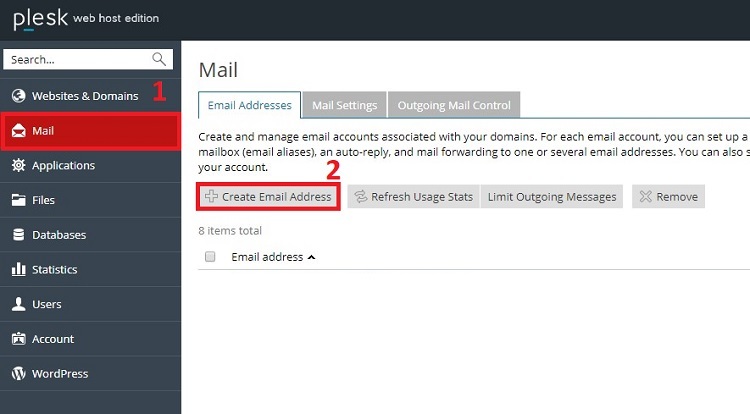 2.1) This area shows the list of email addresses already existing on your email hosting account. Each email address must be unique. 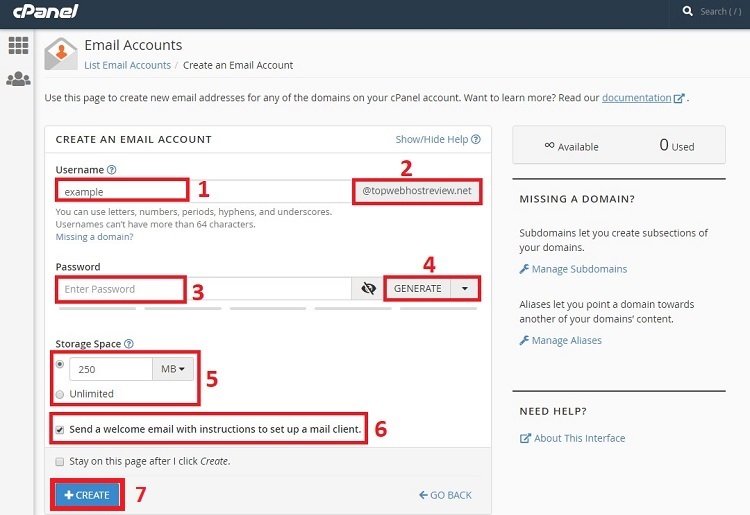 2.2) Click on ‘Create’ to begin configuring a new email address. 3.1) Type in a unique name for the email address you are creating. Normally this is created to reflect either a personal company email such as [Е-маил заштићена] or as a representative of a business function such as [Е-маил заштићена]. 3.2) This is the domain name which is associated with your email hosting. You will not need to change anything here. 3.3) Enter a new password to be associated with this email address. I recommend that you follow strong password creation policies. This normally means a password should include a combination of upper and lowercase characters combined with digital and special characters. It would be better for each account to have a unique password rather than recycling the same one over and again. 3.4) If you can’t think of a strong password or are unsure, click on the ‘Generate’ button and the system will randomize a strong password for you. Make sure you take note of it! 3.5) Here you can set the amount of storage space that is to be allocated to the email account. How much space you allocate will depend on how many accounts you need to set up and the space that is available. Remember that emails today often come with large attachments and running out of space may result in problems receiving new mails. 3.6) If you aren’t creating this email for yourself, click this option to send a welcome mail to the new user. Remember that this email gets sent to the account you are creating, so you will still need to provide the email address and password to the user directly via other means. The welcome mail can be helpful as part of the onboarding process for new colleagues. 3.7) Once that’s all complete, hit the ‘Create’ button and you’re done! Plesk is the Windows-based version of a web control panel and is just as simple as cPanel to use, if not more so. Remember, the type of control panel doesn’t really affect your email hosting and the difference is all in how the configuration is done. 1.2) The display pane on the right will then show the indicated screen. 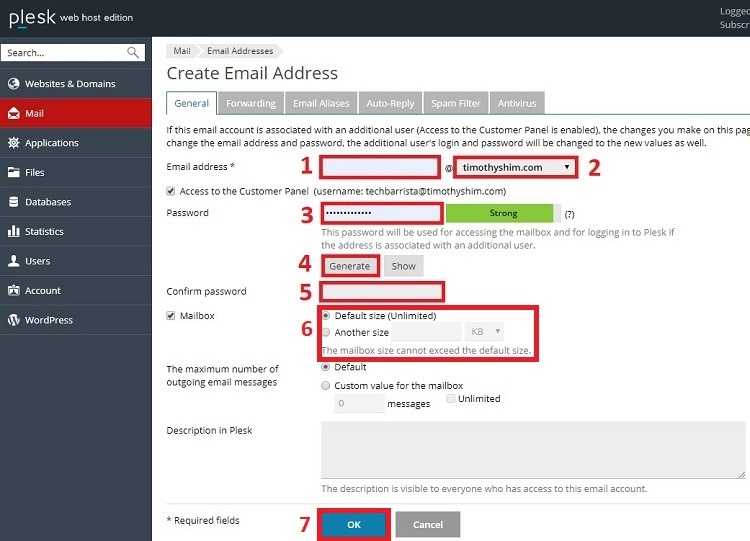 Click on ‘Create Email Address’ to start the configuration process. 2.1) Enter a unique email address here. This name needs to be unique as the email system does not allow duplicate names on the same domain. 2.2) This is the domain that the email address will be hosted on. If you have only a single domain name, you will not need to change this. If you have more than one, then clicking it will show a list of domains you can choose from. 2.3) Enter a strong password here. This normally means a password should include a combination of upper and lowercase characters combined with digital and special characters. It would be better for each account to have a unique password rather than recycling the same one over and again. 2.4) If you feel stumped or are still unsure what makes up a strong password, clicking ‘Generate’ will have the system make one up for you. Remember to take note of it. 2.5) Enter the same password again. This is just the system’s way of ensuring that you are remembering the password correctly or making you check it in case a typo was made. 2.6) You can choose to use the default space allocation for the mailbox size or to specify the limit. By default, Plesk allocated the maximum account-allowable space for that email address. The amount varies depending on what the email hosting providers sets it to. 2.7) Once you’ve entered all the necessary fields, click ‘Done’ and the email address will be ready. If you aren’t creating this email for yourself, remember to send the login details to the person you have created this email account for. Mail Exchange (MX) records are a type of DNS record. They indicate on record where emails sent you are will be routed towards. Unlike email address which must be created each time you want a new one, MX records only need to be set up once per domain. There are two components of an MX record; Priority and Destination. Приоритет – If you have more than one MX record, the priority allows you to set which will be given preference. A smaller number will indicate a higher priority. For example, if you have two MX records and one is set to Priority 10 and the other 20, the one with Priority 10 will be given precedence. дестинација – This is the user-friendly version of a working domain name. by user friendly I mean that it cannot be an IP address, but the name associated with that IP. 1.1) Log in to cPanel and scroll till you reach the ‘Domains’ section. Click on ‘Zone Editor’. 2.1) The domain indicated here shows what valid domains you can create an MX Record for. 2.2) Click on ‘+MX Record’ to start the configuration process for a new MX Record. 3.1) Enter the Priority of the MX Record here. MX Record priorities are usually changed or allocated in factors of 5 or 10. For example, if you have only one MX Record you might allocate it as Priority 5. 3.2) Enter the Destination address. It is usual to label this as mail.yourdomain.com as indicative that it is a MX record for your mail server. Once you’re done click on ‘Add an MX Record’. 1.1) On the left navigation pane, click on Websites & Domains. On the right viewing panel, scroll to the domain you want to create an MX Record for and click on ‘DNS Settings’. 3.1) This is a dropdown list of record types you can create. Click on it and select ‘MX’. 3.3) From the dropdown list, choose the priority to be given to this mail server. You will not need to configure this unless you have more than one MX Record. Once done, click ‘OK’ and your MX record will be done. Sample – MX record of WebHostingSecretRevealed.net. A Sender Policy Framework (SPF) Record indicates which mail servers can be used to send email form your domain. They are normally defined in the DNS area of your web hosting account and are saved as TXT Records. The SPF Record always with a ‘v=’ which is the SPF version in use. The most common would be ‘spf1’ and is almost universally accepted today. Everything that follows the ‘v=’ indicator are the rules that define the hosts allowed or not allowed to send email from your domain. 2.1) In cPanel the main Zone Editor screen only gives you access to create or edit 3 record types; A, CNAME and MX. To create a TXT record for SPF Record you will need to click on ‘Manage’ to enter the extended area. 3.1) On the right side of the screen there will be a dropdown menu where you can select the type of record you want to create. Expend the list and select ‘Add TXT Record’. 3.2) Under the ‘Record’ column you can type in / paste your definition for the SPF Record. Once done, click ‘Add Record’. 1.1) In the Plesk control panel, click on ‘Websites & Domains’ on the left navigation bar. On the right side viewing panel click on ‘DNS Settings’. 2.1) Once in the DNS Settings area, click on ‘Add Record’. 3.1. From the dropdown menu, select the TXT record type. 3.2. Enter your SPF Record definition here then click on ‘OK’. You’re done! Configuring email for your business can be a relatively easy task. In many cases even if you want to bypass the issues of setting up MX and SPF Records, you can easily ask for help from your host. Remember that these are areas that usually only need to be managed once. The creation of individual email accounts is relatively simple and if you follow the steps outlined here there should be no major issues. However, do remember that tech support is usually only an email away – which brings me to my final point. Објавили смо и један број упутстава за оне који траже домаћина.